Seatrout, aka Speck’s, are a staple in Tampa Bay. Much like redfish- this species is available during all of our fishing seasons. Whether looking to fill a cooler or battle a gator – Tampa is the place. Most commonly dwelling over the grass flats, Tampa seatrout offers our anglers the opportunity to keep their day full of activity. These guys will readily hit a lineup of artificial or live baits. If big seatrout is truly your mission, we have them. These “gator” trout in the 25+ inch range patrol these waters regularly. When you get into the 23+ inch range, you might even think you hooked a snook. Spotted Sea Trout (also known as weakfish) are one of the most sought after fish in Tampa Bay. 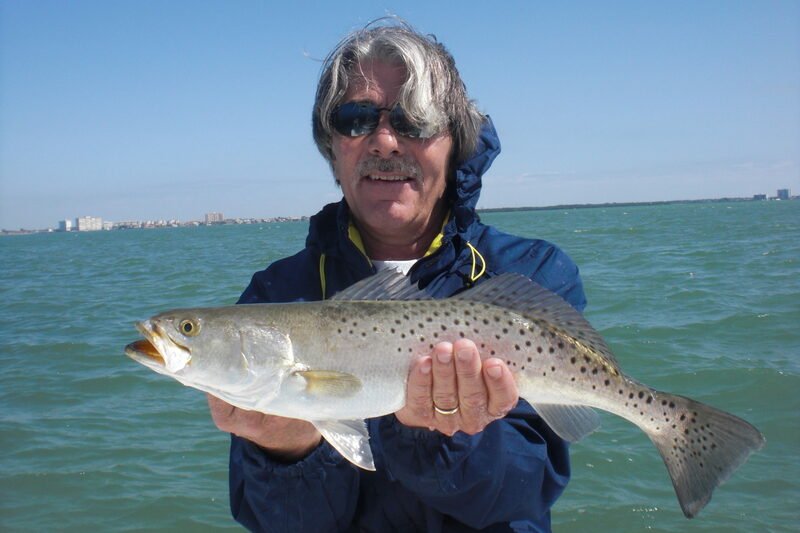 Most inshore fisherman love to target Trout. They primarily live around the deeper grass flats and use these same areas as breeding grounds. You will typically find Trout in big schools around grass flats from 1 to 6 feet of water. Most in the Tampa Bay area range from 10 to 30 inches in size with the average right around 17 inches. Trout not only make for a great fight but also taste delicious with a very mild white tasting meat. You can catch Sea Trout in Tampa Bay year round but the best months to catch them are typically the cooler months (From October to May). Some specific features of Spotted Sea Trout are the black dots on the top of the their backs. You will also notice the big yellowish mouths with a one or two teeth in the front. Trout are protected and have a slot size. Tampa Bay slot is 15 to 20 inches with a bad limit of 4 per person. You can keep one of the 20 inch size. Season is year round.